Lyme Regis, also known as “The Pearl of Dorset”, is a stunningly beautiful seaside town located on the Southern coast of England. It is a place steeped in history and mystery. It is one town you could call the “time-line” of England, revealing a lot about the ancient days of the UK. People have inhabited Lyme Regis since the Stone Ages. Thousands of artefacts have been found in and around the town such as a Neolithic Stone Axe that dates as far back as 4000 BC. Other discoveries include a Bronze Mirror (100 BC), Tobacco Pipes (17th Century) and many, many more objects of the past. 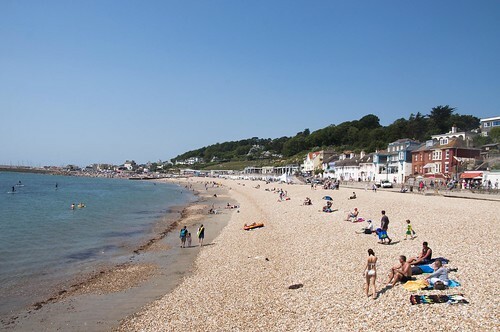 The earliest written account of Lyme Regis can be found in the Domesday Book of 1086, written by William the Conqueror. But its history goes back a lot further than that of the human race and that is what makes it one of England’s greatest attractions. In a time long forgotten, dinosaurs use to roam these lands. Lyme Regis is right in the middle of what is known as “The Jurassic Coast”, a large stretch of coast that is known worldwide for its abundance of fossils and ammonites. It attracts geologists and lovers of history from all over the world, especially to the Blue Lias Cliffs. You can come any time of year and you will see a plethora of people chiselling away at the cliffs in their effort to find these little pieces of history. But let us come back to the present. Lyme Regis is not only known for its vibrant history. It is a place of breathtaking scenic beauty that is rich with culture. It plays host to many arts and music festivals. In summer the beaches are filled to the brim with locals and tourists soaking up the sun. Both the beach and the town are filled with quaint cafés and restaurants that serve some of the freshest sea produce found in England. Take a walk through the town and you also find loads of stores selling unique and vintage clothing and of course, all kinds of fossils. If you are visiting England, Lyme Regis is not to be missed. There is something for everyone to do. If you are a lover of history, natural beauty or just travelling you cannot go wrong with this brilliant seaside town.